Wrapped around my iPhone, the PowerSkin fits perfectly with its low profile, protective silicon case. It’s hard to believe, but this sleek case houses the latest in battery technology, doubling your talk time on the iPhone. The PowerSkin couldn’t be easier to use. One slipping motion, like stepping in to a slipper, and your phone is not only protected from drops, but also energized with XPAL powered battery technology. 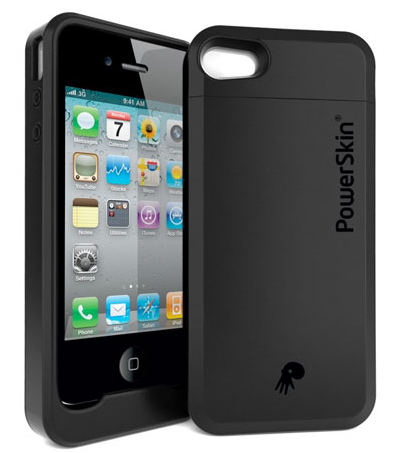 Depending on your particular phone, the PowerSkin will deliver from 4.5 to 8 hours of additional operating time. Each case comes with a micro USB port for recharging and an on-off button, in case you want to hold off charging your phone until its internal battery has been expended. I was pleasantly surprised to find out that the micro USB to standard USB cable is capable of syncing with iTunes. No need to remove the phone from the PowerSkin, and no more searching around for that special sync cable that came with your iDevice. Simply plug the cable into the PowerSkin and plug the other end of the cord into a USB port on your computer. iTunes pops up and sync starts right away. The PowerSkin is a pleasure to hold with a non-slip rubber exterior. The case is extremely light weight and it comes in models for iPhone, myTouch, HTC, Samsung Galaxy & Vibrant, Droid, and BlackBerry. See all available models online at Power-Skin.com or shop for them at Amazon.com, Bestbuy.com and Staples. iPads help fly your next flight?